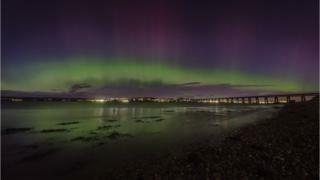 A spectacular display of the Northern Lights could be seen down Scotland's east coast in the early hours of Friday morning. 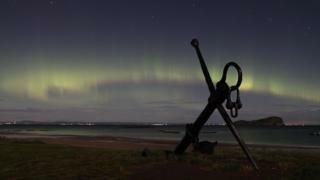 BBC Scotland news website readers have been sending in images of the Aurora Borealis from places on the east coast as far south as Edinburgh and North Berwick. 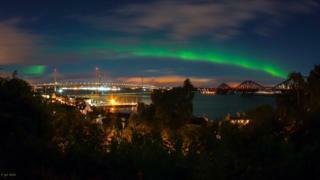 Scotland is the best place in the UK to observe the Northern Lights but it is usually much further north. 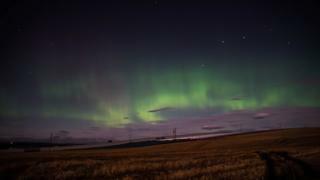 The beautiful light shows are caused by the interaction of the solar wind - a stream of charged particles escaping the Sun - and Earth's magnetic field and atmosphere. The Earth's magnetic field traps some of the particles and sends them on a collision course with molecules in the atmosphere. As a result of these repeated, tiny crashes, energy is released in the form of light. 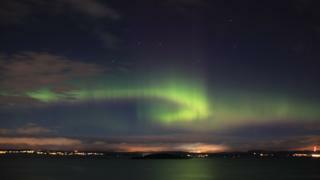 The aurora was also seen across other parts of Scotland, including Oban on the west coast. 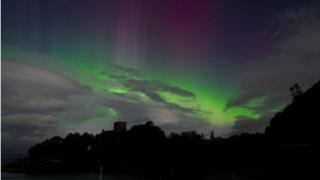 Image caption Fiona Baker said she had been aurora hunting multiple times to Iceland and Finland without much luck, but never expected to see them like this on holiday in the UK. 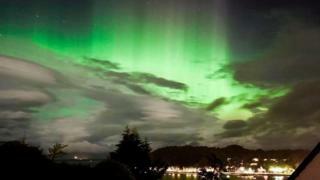 She took this overlooking Dunollie Castle in Oban, Scotland, at 1.30am.